After the American Revolution, a Protestant religious movement referred to as the Second Great Awakening or the Great Revival swept across the new nation, and especially so in the South. It fueled the growth of Baptist, Methodist and Presbyterian congregations across Georgia, especially the Methodists. 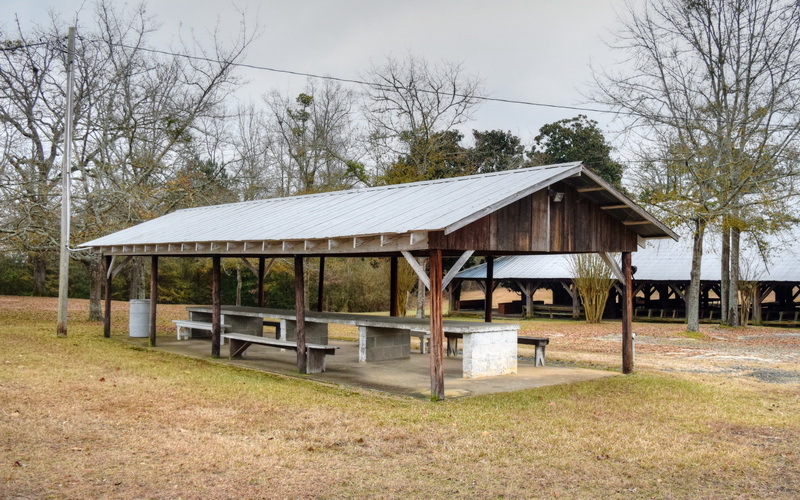 An outgrowth of this movement, the camp meeting ground, became a cornerstone of the movement and resulted in the establishment of these special meeting places across the state, many of which still exist and are going strong. Flat Rock Campground, established in 1879 is one of the these – still thriving after 140 years. 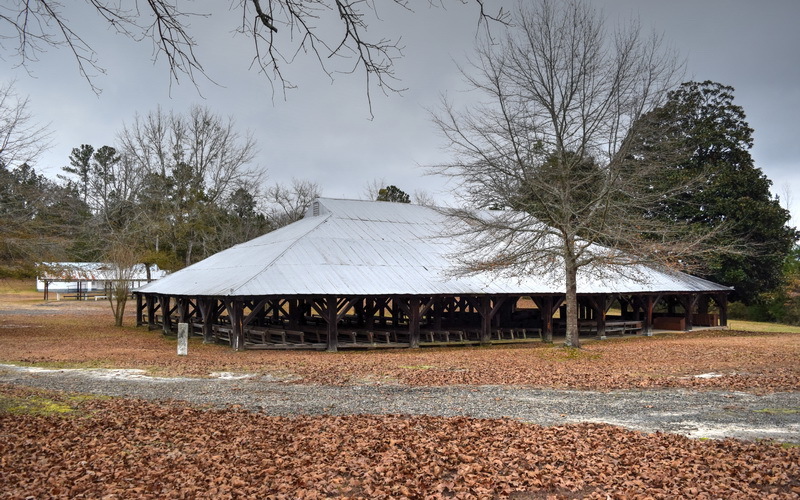 In 1879, the minutes of the North Georgia Methodist Conference state that “Four campgrounds were erected: One at Flat Rock, built this year, a large well built, comfortably seated arbor with five tents furnished and fifteen projected”. For two years before the arbor was erected camp meetings were held under a brush arbor. The history states “This arbor was built by A.B. Lashley in 1878. People came by mule wagons, buggies and oxcarts. Some brought their milk cows. In the early days lights for the arbor were kerosene lamps. Prior to electricity a spring furnished water which many times would be drained dry. When electricity became available, a deep well was drilled and a pump installed. A hotel was available for guests both day and night. For years no refrigeration was available. A big pit was dug and blocks of ice were put in and covered with dust”. The very earliest camp grounds were held outdoors with attendees camping on the grounds. Over time, camp ground meeting sites came to be distinguished by a particular type of architecture involving a large open tabernacle or arbor, surrounded by permanent ‘tents’ which are owned and populated by families who often hand them down from generation to generation. Today most meeting grounds are managed by self-perpetuating boards of trustees that own the land, while individual families own the tents, which are often passed down through generations. The topography of the land and location of suitable shade trees and water sources were critical in site selection and are often featured in the naming of the site. The name Flat Rock was chosen because one hundred or more acres of flat granite rock was located nearby. This Tabernacle was placed on the property and oriented just like most rural churches of that era. The entry is on the north end and the chancel, pulpit and apse (if there was one) on the East end… where the sun rises. This is a view from the entry way looking toward the chancel and pulpit. Flat Rock like all the early Tabernacles was of post and beam construction and built by the congregants using timber harvested from the site. 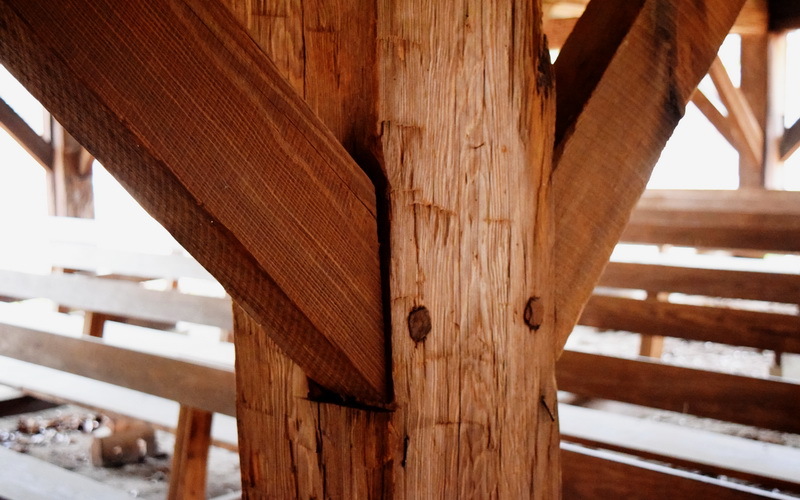 Post and beam has been used for centuries and is a building technique that relies on heavy timbers and precise joinery, not dimension lumber. All joining is accomplished using only wooden pegs driven into strategically placed holes! As you can see in the photograph, this style honors the rustic appearance of exposed timber and makes it a central element of the building’s visual impact. You cannot help but be awed by the decorative grandeur of these structural, geometric patterns. 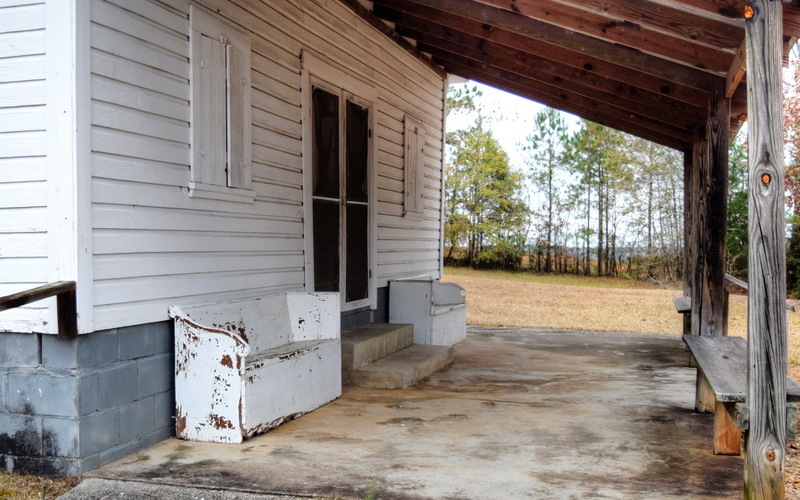 Here we see the very spare “Amen Corner” benches” that are traditionally to the left and/or right of the chancels in rural, 19th century churches. The close-up view of the south sides congregational seating reveals that these Tabernacles were designed to seat hundreds of attendees. Imagine this place filled to capacity for hours and hours every day for a week or two. Crowds came from near and far to hear from many different preachers and the occasional famous ones. What kind of oratory skills would it take to effectively preach a sermon to this vast audience? Aren’t we looking at religious gatherings on a major scale similar to the Mega Churches of the 21st century? Clearly the Camp Meetings became some of the bedrock upon which the Bible Belt was built. We are privileged to be able to still experience historic sites like Flat Rock that are still alive and well in Georgia. Here we have a view of the Tabernacle from the east end. These structures were built to withstand the elements, so much attention was paid to insure the ability to survive heavy winds and violent storms. The roof is vented to insure the wind cannot lift the roof off in gale force winds. Looking at the forest of squat columns and supporting beams above, you can see why most of these buildings remain standing and usable today after 125 years or so of exposure. The interiors were very spartan and utilitarian. 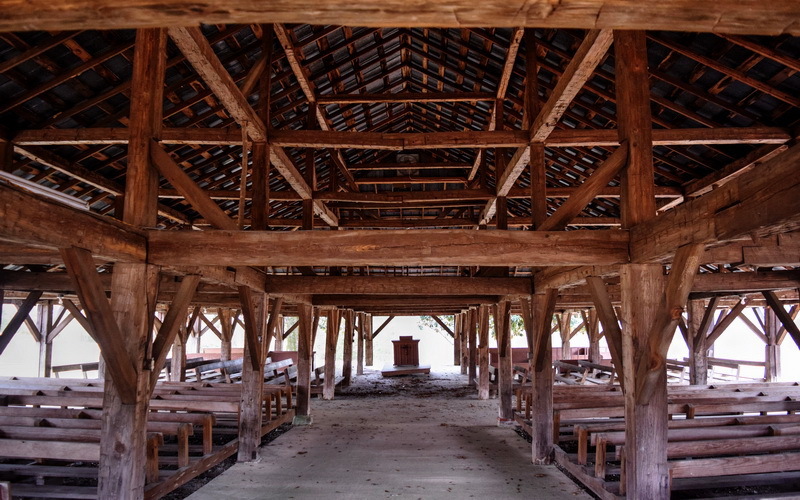 The pews are simple heart pine benches… no frills in this sanctuary then and now. These buildings were raised by local citizens whom we think were overseen by a few extremely capable master carpenters. It would be interesting to learn more about those experienced builders and how they came about their knowledge. 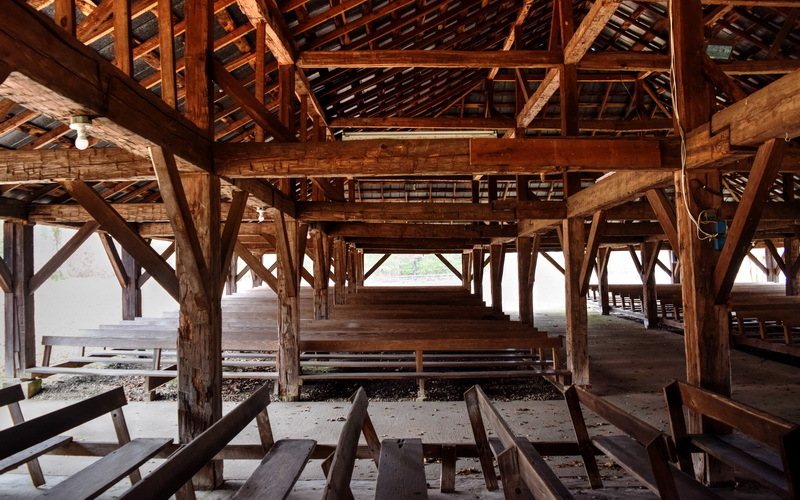 In any case, imagine how difficult it would be to hand hew, cut, drill, assemble and peg the huge beams seen above without today’s tools and equipment. Hats off to the builders and their remarkable edifice at Flat Rock. Here we see the simple joining methodology inherent in post and beam construction. Drill holes in the correct places and then drive tightly fitting wooden pegs through the holes. Imagine how hard it was to complete the many hundreds of joinings at this tabernacle. The photo you are looking at here is of a low post. Note that this hand-hewn post was likely an original one while the support beams are probably of later vintage given the saw marks and even finish. Here we see an open sided structure shading several picnic tables. It is a later, mid-20th century shed... probably built to augment the earlier dining hall. This is a close-up of the Dining Hall porch at Flat Rock. 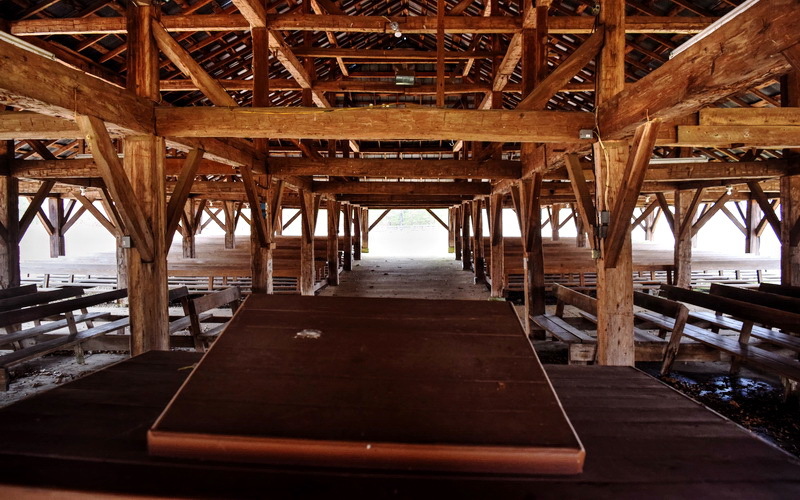 Imagine the number of pilgrims that sat on its wooden benches in the distant past. This is the John G. Davis Dining Hall whose porch was pictured earlier. We believe it served up food for camp ground attendees for most of the 20th century. We salute the trustees and the congregations who have maintained the traditions and the grounds at Flat Rock for over 140 years to passed on to future generations. We are indeed grateful. 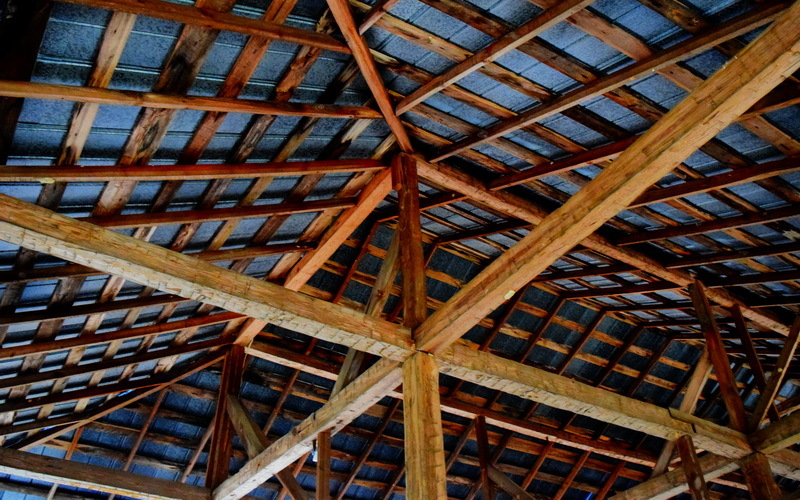 As a child , I remember going to the camp meeting with the campers living in tents and even sheds on the sides of barns . the outside walls were made of sheets hanging around to protect the belongings form the animals surrounding the area. People even brought the milk cows and pets, Children running around like they were in a protected large playground. The overseer ‘s house was on the top of a small rise so that he could see all around the property keeping things in order. There was never any disagreements because they camping on Holy Ground. They visited and cooked the family meals on a campfire outside with maybe several families participating in the sharing of the food and preparation and cleanup. They all had good times and came away with many good memories and many people filled with the Holy Spirit. It was a way of life for families to return each year. Living history. Thanks for sharing. Spent a week there sleeping in rustic cabins. It was a spiritual place. After evening service those who wanted to would walk down to the big flat rock, build a fire and sit around while someone told us ghost stories. It seemed a long walk back in the dark to our cabin! Great fun! Glad this wonderful place is being recognized. Thanks for this article. 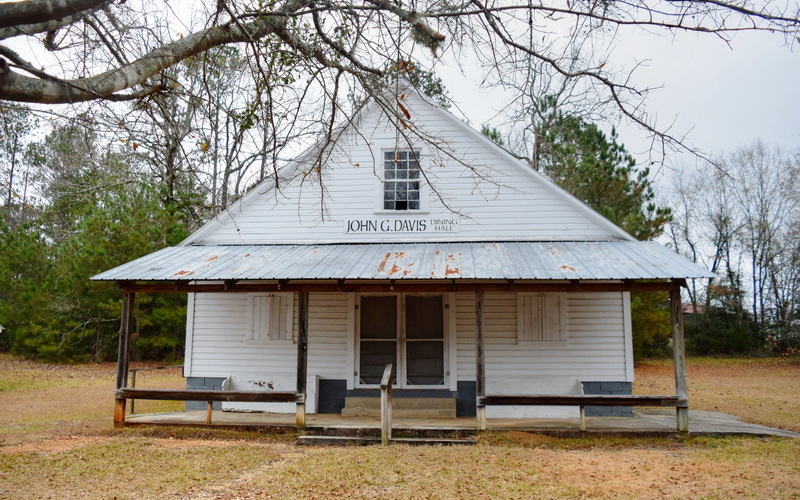 I grew up going to a family reunion in a similar Methodist camp meeting ground in Dooly County. Do you have a list of all similar places in Georgia? I knew they were around but I grew up Baptist and didn’t really know about other locations. I also enjoyed learning more about the Lutherans in sumpter county. I learned in recent years about distant cousins who were Lutheran in Macon County and I’m still working in them, but I didn’t know there were more Lutherans in nearby counties. Thanks for connecting more dots! There is a history of Dooly County Ground. Check the Vienna United Methodist Churc orthe Distrist Superintendent of the Americus District. Wonderful place, wonderful memories !!! Sonny, I am so happy you included Flat Rock. My grandmother was born in Heard County in 1872 and grew up going there. It is very similar to Salem campground near Conyers. I can’t wait for the next book!